A YouTube video was released last week by the internationally renown hacker group "Anonymous" involving the planned Saskatoon protest centrally focused on political corporatism. 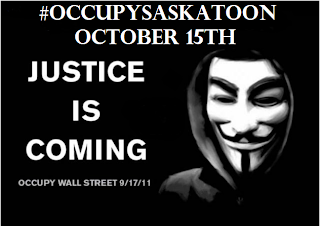 "We are calling all Canadians to occupy Saskatoon to spread the occupy Wall Street movement," said the association in the video. Members of the Saskatoon-based movement have e-mailed News Talk Radio concerned that the video makes the protest seem more extreme than it is, including one of Occupy Saskatoon's organizers Peter Garden, who also owns the alternative bookstore Turning the Tide. "Our members would not call for people to cover their faces at a rally or demonstration," wrote Garden in his e-mail. "Anonymous is an independent entity which has produced this video without our knowledge or permission." 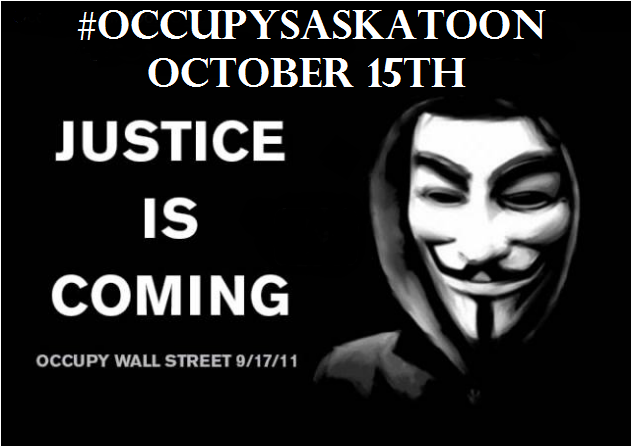 The Occupy Saskatoon Facebook page does display the protest's mandate. "We will rise from the grassroots to build a better world based on real democracy and the values and priorities of the people, not the richest one per cent." Anonymous asked Saskatoon protesters to wear masks to hide their identities, called on their willingness to "die for [their] country," and argued that citizens should be willing to do jail time. The video asked viewers to go to the facebook page to enlist themselves in the protest, and linked to it in its description. Claimants of the Anonymous association have in the past maintained that they are not precisely a group, but a banner under which people around the world rally under for a common cause.